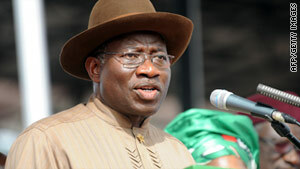 Goodluck Jonathan's election as president was greeted by riots in cities across northern Nigeria. (CNN) -- Bomb blasts Monday in Nigeria's northeastern state of Borno killed three people and wounded dozens, raising fears that an Islamist group will step up attacks against voters on the eve of national governorship elections, police said. Nigerian police told CNN that Boko Haram, an Islamist sect that has challenged Nigeria's government, is responsible for the attacks, which they described as an attempt to intimidate voters who this month re-elected President Goodluck Jonathan, an ljaw Christian from the south. Concerns about ongoing violence led Nigerian election officials last week to delay the planned gubernatorial elections in two of Nigeria's 36 states.